She martriculated in Zastron and studied Drama and languages at Stellenbosch University and taught German and Afrikaans at Rhenish Girls' High School for five years. 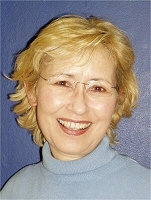 Sara (Saartjie) illustrated four books. The poem, X-foto, appeared in the anthology Millenium Moments in 2000. She is married to Leon Fouché, a minister in the DRC. They have three daughters, Cara, Tanya and Nadia. Sara taught for nine months English in Taiwan with her second daughter, Tanya. Perlemoen uit Droë Grond - 'n Plakboekstorie. In this book the illustrations form an intrinsic part of the story. Styles of illustrations differ as each character "illustrates her own part" in the scrapbook.